Full mouth restoration refers to a gamut of procedures which help in reconstruction or rehabilitation of teeth in both the upper and lower jaw. ADC offers comprehensive packages for full mouth restoration in Los Algodones – Mexico which cost much lower than in the US. *Contact us through the website quote form for the latest prices and dental specials. There is no definitive answer to what a full mouth restoration entails as the reconstructive needs may vary from individual to individual. A common procedure used for full mouth restoration in the edentulous, all on 4 implant system involves placement of four implants topped by fixed prosthesis thereby restoring function in the complete arch. The procedure allows you to get your artificial teeth the same day of the surgery. Major benefit of this kind of implant is that you get a brand new set of teeth in a single appointment. Here’s why having all on 4 implants in Los Algodones can prove to be beneficial. The All on 6 implant system involves placement of six implants in the jaw to provide support to permanent dentures or crowns. These six implants are positioned in a manner to provide natural support to artificial teeth. Implant-supported dentures help restore function in people missing all or most of their teeth but with enough jaw bone for implants to be dug in. Implant-supported dentures come with a unique attachment that gets affixed with the attachment on the implants. More information on implant overdentures in Los Algodones can be viewed here. Dental veneers are extremely thin, bespoke shells made of natural tooth colored material that covers up discoloration, cracks or gaps in teeth. If you are edentulous or on the verge of becoming edentulous, you will find your quality of life getting substantially improved at highly pocket-friendly prices with full mouth reconstruction in Los Algodones, Mexico. Besides giving you back the ability to chew on foods normally, full mouth rehabilitation also helps improve speech and instills confidence as you no longer feel the need to cover up your mouth out of embarrassment. A bridge is a permanent, non-removable replacement prosthetic for one or more missing teeth. It runs across the gap created by missing teeth. It comprises artificial tooth/teeth fused between two dental crowns (caps). The caps are placed on the real teeth which have been prepared to allow the bridge to anchor onto them. In case of the edentulous, bridges are placed on implants embedded in the jawbone. These are known as implant-supported bridges. We offer affordable packages for full mouth reconstruction with dental bridges. We also offer full arch restoration with flexible removable partial dentures (RPD). Traditionally made of acrylic polymers, dentures are now available in a biocompatible material called Thermoplastic Comfort System (TCS) which is a good alternative for individuals allergic to acrylic. This kind of partial denture is extremely pliable fitting in well with the natural contours of the oral orifice. As the clasps are colored to match the tooth and the surrounding tissue, it gives more aesthetically pleasing results. Flexible partial dentures are also known to feel natural and comfortable to those wearing them. 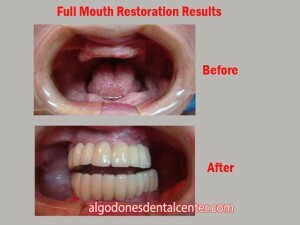 Why Los Algodones for Oral Restoration? Located in Baja California in Mexico, Los Algodones is a popular destination with American and Canadian dental tourists seeking low cost dental work south of the border. Home to several dental offices and pharmacies offering treatments and medications for just a fraction of US prices, the quaint border town offers some logistical advantages. Los Algodones is just about seven miles from Yuma, Arizona. 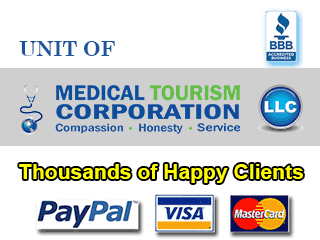 Besides saving on your treatment costs, you also save on precious time and traveling expenses. The clinic is onlyabout two blocks from the Andrade Port of Entry in California, and one can reach it by just walking. This discounts the need for local transportation. The clinic offers 2-year guarantee on implant-crown work. More details on the dental clinic in Los Algodones. Will I find it difficult communicating in English? No, as many staff members at the Algodones Dental Center (ADC) are bilingual. Additionally, we ensure there is an English-speaking staff member present in the OT while you are in the dental chair getting treated. Where can I stay during my full mouth rehabilitation procedure? 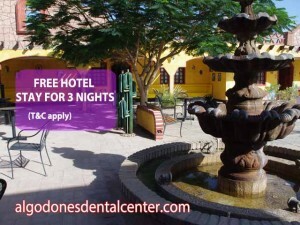 We can arrange your stay at Hacienda, the only hotel in Algodones. We offer special tariffs to our clients. 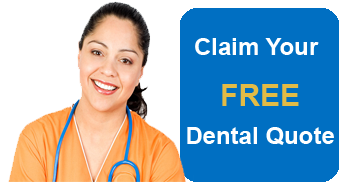 Under our current limited time special, we offer free lodging for all dental work exceeding $2,000 (terms and conditions apply). In addition, there are many hotels in Yuma for dental tourists not wishing to stay in Mexico. Which is the peak season? The peak season runs from December to March. During this time we recommend you to make bookings well in advance. Also a morning dental appointment would come in handy to avoid the rush at the Andrade border crossing. Can I get sleep sedation dentistry? While we normally use local anesthetics for numbing the area, we also provide sleep sedation dentistry through nitrous oxide or intravenous (IV) for an extra price ($600 as of April 2016). Just inform our patient coordinator prior to your dental visit about your requirement, and we will make sure your full mouth rehabilitation is carried out in a “breeze”. You could either pay in cash, with debit/credit card, wire transfers, traveler’s/personal/cashier check, or even money order. (Payment with cards carries an additional charge.) We can also assist you in the documents required for getting reimbursement from your dental insurance provider (terms and conditions apply; additional fee also applicable). Am I a Candidate for Oral Rehabilitation? Contact us for more information on full mouth restoration by filling in the estimate-request form on the right. Turkyilmaz I, Company AM, McGlumphy EA.Should edentulous patients be constrained to removable complete dentures? 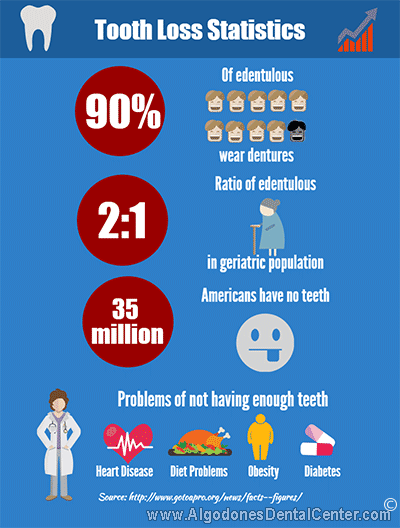 The use of dental implants to improve the quality of life for edentulous patients.Gerodontology. 2010 Mar;27(1):3-10. doi: 10.1111/j.1741-2358.2009.00294.x. Chandran, Segin, and Nasil Sakkir. “Implant – Supported Full Mouth Rehabilitation: A Guided Surgical and Prosthetic Protocol.” Journal of Clinical and Diagnostic Research : JCDR2 (2016): ZJ05–ZJ06. PMC. Web. 28 Apr. 2016.